When you walk down the streets, looking up at the walls and chimneys of your area you will see a wide variety of different types of aerials and antennas used for TV, FM & DAB Radio. If you’re anything like me you will spend half your time looking up at them, which is perfectly natural for TV aerial installers. In this blog I go over many of the different types of antennas that are out there and help you decipher what is what and maybe help you choose your own. Yagi aerials are the aerials that most people will be familiar with here in the UK & Ireland. A Yagi can look different between different manufacturers and models, but the principles are the same. You have along rod which is the length of the aerial which is called the boom. Off that you have at right angles smaller conductive “elements” that pick up the radio-waves in the aerial. The smaller and closer together these elements are the higher the frequency that the aerial is intended to receive. There is more of this in banded aerials and wideband aerials. Off the back you have a back reflector which is designed to block signals coming in from behind the aerial. Connecting in between the back reflector and elements there is a half wavelength folded dipole to which the coaxial cable connects. A Yagi aerial works on the process that the elements resonate at a frequency that the dipole then picks up and transfers onto the coaxial cable which would then run onto and connect to your TV’s. The more elements in front of the dipole the higher the gain the TV aerial would be. 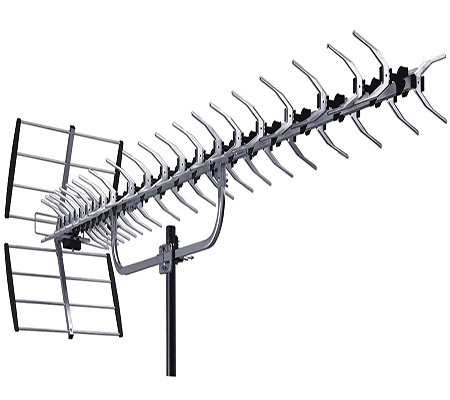 Log periodic aerials have become very popular since the digital switch-over whereas they were hardly installed at all prior where Yagi type and “contract” aerials were the most popular. Log periodic aerials are popular for digital TV is they are very good at rejecting impulse noise which could cause your TV signal to break up and pixelate. They also deliver a very flat frequency response making them perfect for balancing TV signals. A log periodic does not work the same as a Yagi type aerial and thus they look different. Often people mistake a log periodic aerial for an analogue aerial because of the way they look but in reality, there is no such thing. A log periodic aerial is a long rod with “elements” connected to it at right angles with the size and spacing between elements dictating the frequency that the aerial is designed to pick up. There is no dipole or back reflector because it doesn’t need them. Instead of the elements resonating at a frequency the elements behave like individual dipoles with the coaxial cable running inside of the aerial itself. Many types of aerial like the Vision models you have to feed the coaxial cable through the aerial and connect the opposite end of the aerial, like the Vision models but other type have this built in and you just connect the coaxial cable at the beginning, like the Optima models. Log periodic aerials are typically used for TV aerial signals,but you can also purchase a DAB model for DAB radio. Log periodic aerials are not so good in weak signal areas. For that I recommend a high gain TV aerial,but banded log periodic aerials which when used correctly can increase the signal gain of the aerial. A high gain TV aerial is an aerial which is designed to increase the signal strength received from a transmitter, which will deliver more signal than a Yagi type TV aerial or log periodic design. High gain TV aerials are required in weak signal and medium signal areas but are also used in good signal areas when delivering the TV aerial signal to multiple TV’s. A high gain TV aerial is typically longer than other types of TV aerials as the extra signal gain comes from extra elements connected to the aerial boom. High gain TV aerials also usually have larger back reflectors and the longest models usually also come with a boom arm. This fits in between the boom in between the elements and allows the aerial the mounted centrally onto a pole to help spread the antenna weight and wind loading forces. Without this over time the aerial would gradually begin to tip down at the front and face the ground which can cause other types of signal problems. The boom arm should be fitted so that it is at right angles to the elements as to fit it the same way the boom arm and aerial mast will act as a reflector and can impeded the performance of the TV aerial. When installing a high gain TV aerial with a separate boom arm the aerial would usually need to be installed at the top of the mast to avoid the aerial mast getting in the way of the elements. The most commonly installed high gain TV aerial is the X type aerial. They are called X type aerials because they have several dipoles in parallel each of which in a shape of an ‘X’ by doing this increase the forward gain of the aerial. Many designs of X aerials have as much as 100 elements with many using full wave dipoles to achieve better matching characteristics. Common X type aerials are Vision 32 and Antiference XG10. Another type of high gain TV aerial is the Bow Tie models.These are essentially the same as an X type aerial and work the same but instead of the ‘X’ elements/ dipoles, but with a Bow Tie design instead of an ‘X’. Another design of high gain TV aerial is a multi-boom TV aerial. These have more than one boom which angles at different direction onto which the elements are attached. 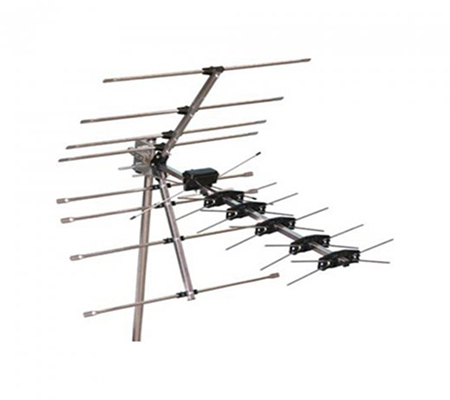 The most common type of multi-boom TV aerial would be the Televes Dat range and the Labgear Tri-Boom aerial which is available in places like Screwfix. As more elements can be added due to their being more than one boom, this can dramatically increase the signal gain of the TV aerial. The Televes Dat75, now Dat TForceLR was one of the only aerials to achieve a CAI standard 1 when these standards were still in use. A word of warning however when installing these aerials ensure that the brackets are strong enough to support the weight of the aerial as the have a tendency to point to the ground over time. Most aerials installed these days are called wideband aerials, often just abbreviated to ‘WB’ and these can be used on all TV transmitters.This convenience is often over shadowed by the fact that a grouped version of similar size will offer a greater signal gain and cut out unwanted signals from other neighbouring transmitters. This is done by reducing the frequency range that the aerial can receive meaning that grouped aerials can not be used on all transmitters. The aerial group must match the transmitter group. I personally much prefer grouped aerials to wideband aerials but very rarely install them these days, this is because the powers that be keep changing frequencies that transmitters are broadcasting on, often due to the selling off of bandwidth to services such as 4G and 5G, so just I can future proof my clients and customers installations I install wideband aerials. High gain aerials can be installed to overcome to the signal loss when compared to a grouped aerial and band-pass filters can be installed to remove unwanted signals. I’m not going to describe the way they look as you can obtain Yagi grouped aerials, high gain grouped aerials, log periodic grouped aerials and contract grouped aerials. I will just describe the common aerial groups and bands so that you can understand what the difference is. A lot of aerial manufacturers also have the appropriate coloured bung at the end of their aerials which is helpful to identify them but not all of them do so don’t take this for granted. You can see from the above and frequency ranges that not all banded aerials will be compatible with all transmitters; some transmitters are wideband in any case, so you would have to install a wideband aerial in these situations. You can see that there is an old and current wideband range. This is in relation to aerials made before and after 4G with new aerials designed to reject these frequencies. This is likely to get smaller still in the future if 5G is ever released on the population. The group C/D has all but gone too as well as group E aerials and it’s likely that in the future all that remain is group A, group B and WB aerials. But there are numerous old aerials out there still in action from the other groups, so you should be aware of them. These are the TV aerials that least look like TV aerials. A grid aerial is a flat antenna with signal elements inside of it. Grid aerials are not commonly installed post digital switch-over as one of the main reasons for installing them was to limit signal “ghosting” which is an analogue signal problem and cured with digital TV. As grid aerials do not have many elements they are not high gain or very directional, making them unsuitable for weak signal areas. They do on the other hand have a very good front to back ratio which can be used to reduce the strength of interfering signals being received from behind the aerial. You may have heard the term “contract aerials”. A contract aerial is a particular aerial type that was the most common type of aerial installed around 20 years ago. These are often mistaken for analogue aerials and these were often the type of aerials that were type replaced with more modern type higher gain aerials, where as I have already said there is no such thing as a digital aerial. A Contract aerial is actually a Yagi aerial, so I won’t give any further explanation on the appearance. Contract aerials are no good for weak signal areas as they are what is called an entry level aerial. This just means that they are the cheapest and most basic essentially intended for good signal areas. The contract aerials were also most commonly installed were grouped aerials, which I will describe more in the grouped section to help improve the signal performance for the transmitter that was being used. Although you can still buy them, contract aerials are very rarely installed these days.I personally have never purchased one in 12 years, I spend most time removing and scrapping old ones. This is because they do not have an integrated balun to help reject unwanted impulse noise from nearby electrical sources and the dipole connection is very basic, it’s unscreened and is essentially two screw down terminals. One you connect the centre conductor and the other the cable braid.For a couple extra pounds, you can usually buy a log periodic which would offer many signal related reception benefits, so I can’t see why anyone would bother buying them. I personally also put many basic entry level aerial types which do not have an integrated balun into the contract aerial category, such as the RX12 by Antiference but I know many aerial engineers that don’t. Indoor aerials come in two main different varieties both of which I wouldn’t waste my time with unless you lived in a very large block in the middle of the city or you live across the road from your TV transmitter.The two main different types are an amplified type and a non-amplified passive type. 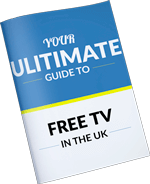 The indoor aerials which are sold as the “super-dooper” range and cost the most are the amplified and connect to your mains electrical supply as well to the TV. An indoor TV aerial is installed by the TV set itself and this hold the district advantage that the TV aerial can be plugged in and away you go, no trips up a ladder and onto the roof necessary. They also hold the huge disadvantage that where your TV is installed there is also little to no signal anyway, so the reception will more often that not be very poor. This is where the amplified or “booster aerials” come in. Often these have huge amounts of signal gain to get around from the fact that there is no or little signal to begin with. I have seen models with up to 45dB which is a ridiculous amount considering that the suggested minimum signal strength that enters into your TV is 45dB so even these usually deliver a very poor signal. This is because you can’t just amplify a poor weak signal and it will by magic become a good strong signal. I go into this more in my blog, ‘Do Aerial & Signal Boosters Work?’. If you’re going to try your own indoor TV aerial a couple of tips. One, install in near the window and high up in the room away from the TV as this often improves the received signal. There are aerials which are sold as “loft aerials”. A professional TV aerial and satellite translation of this is that the aerial is too weak and flimsy to be installed outside. It’s likely that it will just fall apart in the weather and water-log. For this reason, most TV aerials installed inside lofts are just normal Yagi/ log periodic and high gain aerials installed inside. You may need to install a higher gain aerial when installing it inside a loft to over come the signal losses associated with the signal loss passing through the roof. You may on the other hand with the size of the TV aerial be limited where the antenna will fit. For this reason, you may have more success and better signal by installing a smaller aerial higher in the loft. It really does depend from loft to loft and installation to installation,so I recommend that you read our blog on installing aerials in lofts. A common aerial installed in lofts is a log periodic aerial with built in pre-amplifier which can be disconnected if not required and as acts as a masthead amplifier to help boost the incoming aerial signal. I personally never buy these, but they are good to use in lofts where extra amplification is required. There are few aerials which can be used to obtain a good radio signal for FM and DAB radio. Although it is possible to construct an antenna to receive AM radio signals because of the lower frequencies used it would be ginormous, directional FM radio aerials are large enough. I have divided this into two sections these are directional FM aerials and omni-directional FM antennas often just called Omni FM Aerials or FM dipoles. 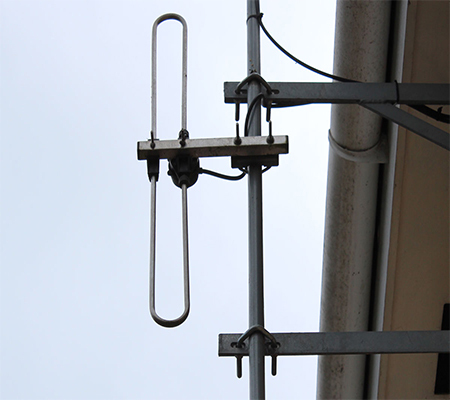 For your reference FM aerials are always installed to receive from a horizontal polarisation. An Omni FM aerial is a single element antenna with a dipole of the correct length to receive FM signals. These are usually, but not always in a circular construction to keep the aerial smaller in appearance. An omni aerial, in theory is not directional at all. In practice when aligned with a spectrum analyser however you can peak the signal by aligning it, but this means that the forward signal gain isn’t that great, in theory it’s 0dB. This more often that not doesn’t make a huge difference as just by getting the aerial, outside and installed high up you will receive a considerably better signal than using an internal FM aerial which is usually included with the radio itself. The regularly is just a piece of wire. A directional FM aerial is more than one element next to each other connecting to the boom with the dipole. The most common of these are 3 element FM aerials which look like a big ‘H’. 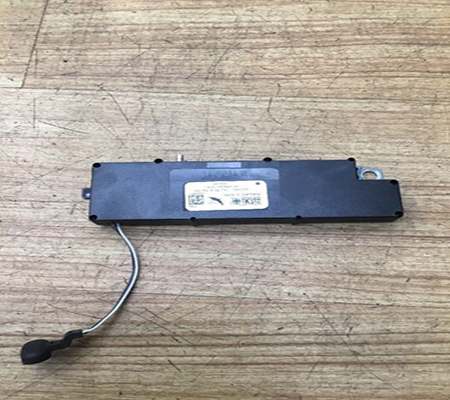 3 element FM aerials are very large when compared to TV aerials because of the lower frequency band that they are designed to receive and the have a tendency and falling apart over time,which can make a bit of a racket. 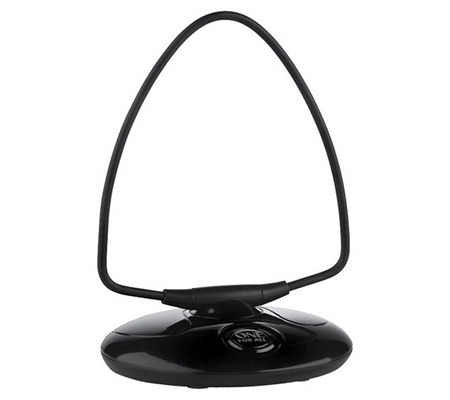 Because of the size of directional FM aerials, omni-directional aerials have become far more popular but if you’retrying to receive weak FM signals you will need a directional antenna. 3 element FM aerials tend to have around 8dB forward gain, but 4 and 5 element FM aerials are also available for extra signal gain. The 5 element antennas are absolutely massive and not very fun to install. DAB aerials can be installed outside to improve DAB reception. Again, like FM aerials DAB aerials come in omni-directional and directional versions. DAB aerials are always installed in the vertical polarisation. An omni DAB dipole is a non-directional antenna. The DAB dipole just looks like a single vertical element rotated back to itself to which a coaxial cable connects to. This is just a dipole but again like FM aerials simply installing them externally and high up on your property will greatly improve your DAB reception. DAB aerials because of the higher frequencies used are smaller than FM aerials. If you need to improve DAB reception further still you will need a directional DAB antenna. You could just read the directional FM section to understand the concept of directional DAB aerials. Extra elements are placed onto the aerial boom to improve the received signal. 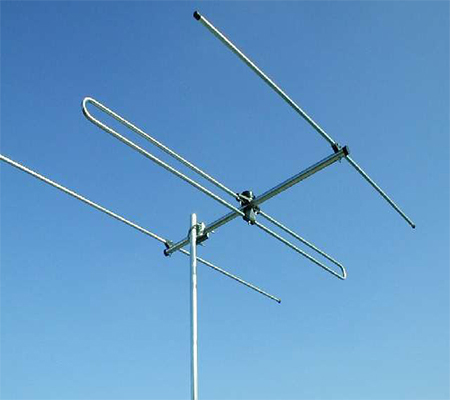 3, 4 and 5 elements versions exist.A 3 element DAB aerial also looks like a big ‘H’ but would be smaller in size to a FM aerial and installed vertically. A FAB aerial, I’m sure you know where I’m going with this one is a combination of FM and DAB omni aerials into a single antenna and a connecting coaxial cable in between the two dipoles. These solve the issue of having to install separate aerials for each of the services but are not suitable for weak reception areas. As only one cable would be installed into the FAB aerial you will also need a FM/DAB diplexer to connect both FM and DAB radios or a two-way splitter. Just bear in mind that a small amount of signal will be lost through the splitter, so you may want to install separate FM and DAB aerials instead, but I have found these most helpful when space on a mast is limited and two separate aerials would not otherwise fit. There are various types of aerials that are capable of receiving TV and radio signals at the same time and come in various types of construction and many do not actually look much like conventional TV aerials. I personally don’t really like using these aerials for TV signals as the received signal will be far less. These often rely of amplification like indoors aerials, to improve the received signal so a power unit is usually required for it to work. These are much better than indoor aerials however so if you have the option of installing one of these on your balcony or an indoor aerial, I would go with these every time. Just putting this on here, but there is no such thing. Nothing on an aerial makes it digital so beware if someone says that you need a digital aerial! I hoped that you liked this blog, if you have any questions please do LEAVE A COMMENT in the blog comment section below. Unless you’re in our coverage area in East Sussex/ South Kent please DO NOT CALL OUR TELEPHONE LINES as we do not have anyone who can offer over the phone support to you. Please DO NOT E-MAIL either as I can’t keep up with all the requests that we get sent. If you leave a comment however I will promise to get back ASAP and everyone will also get the benefit of the question asked and the answer given.